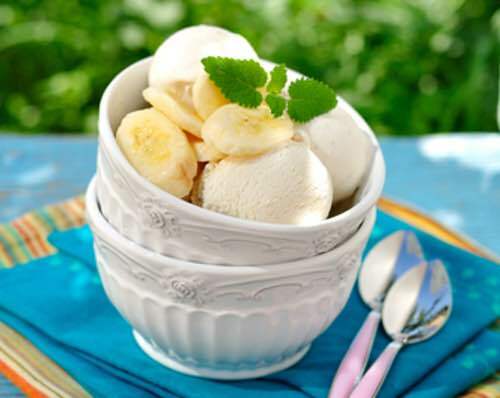 Thanks to Grandma's old fashioned banana ice cream recipes, you can make homemade custard ice cream bursting with the delicious, all-natural taste of ripened bananas. Just try one of the recipes from Grandma's collection and enjoy the best frozen dessert you've ever tasted. I have yet to eat a store-bought ice cream that's supposed to be banana flavored that doesn't have a chemical-like aftertaste. For sure, it doesn't have the fresh, fruity taste that these homemade ice creams do. Try them for yourself. But make plenty, as you'll want second helpings. To three pints of cream, add one pound of pulverized sugar, and six or eight bananas grated into the cream. Freeze. Or, you may boil the cream and add as many eggs as you choose. When cold add the grated bananas and freeze. I like this ice cream just as well without the eggs. 8 bananas, 1 quart of cream, 1/2 pound of sugar. Peel and mash the bananas. Put one pint of the cream on to boil in a farina boiler (double boiler). When hot, add the sugar, stir until dissolved, and stand aside to cool. Beat and stir the bananas to a smooth paste, add them to the cream and sugar; then add the remaining pint of cream, and turn into the freezer and freeze.